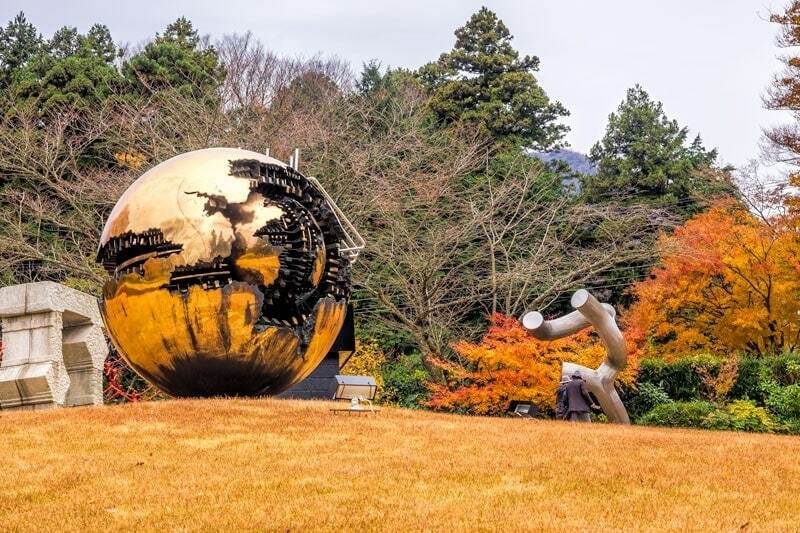 Hakone open air museum is a large well manicured sculpture park with a backdrop of the regions beautiful nature & an eclectic collection of art and artists. There were a couple of things we didn’t do on our first day trip to Hakone that I knew we had to go back for when we had the chance. The first must do was to soak in an outdoor onsen enjoying the sights and sounds of nature and the other was the Open Air Museum at Gora. 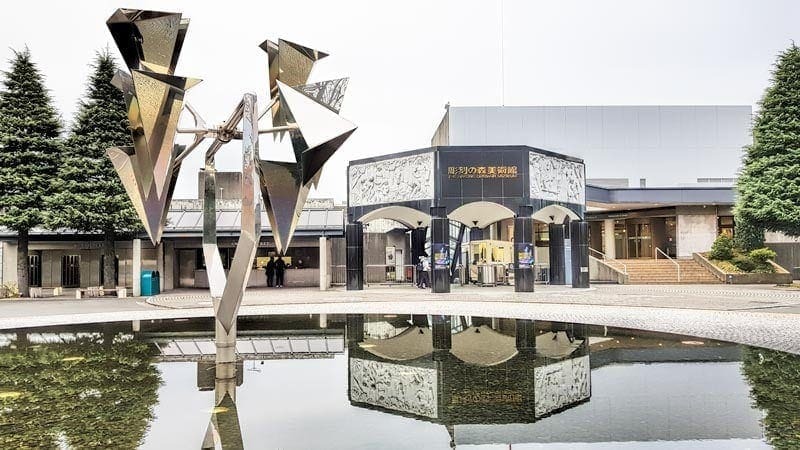 It is possible to include the outdoor art gallery within the Hakone circuit on a day trip from Tokyo using the Hakone free-pass, especially if you’re a medium to fast paced traveller. There were two reasons we didn’t, the first was that we aren’t fast travellers, we tend to get distracted and wander off down little lanes and detours and as it was one of the first stops on the anti-clockwise loops that didn’t seem like a good idea. The other reason was that it was mid-winter and there was quite a bit of snow on the ground. That added a few complexities, firstly it gets dark quite early and we wanted to see the whole circuit in good light. The other part is that the snow and possibly ice on the paths made it super pretty but meant we were likely to be walking a little slower to avoid slipping. In hindsight it probably looked pretty darn incredible in a bed of snow but maybe another time we can return and do that, this time we saw it in it’s autumn colour. It’s a short walk from the Chokoku no Mori Station on the Tozan railway line to the museum, this is the station immediately before Gora, if you missed your stop Gora would work too but it’s slightly further, about a 15 minute walk away. (I’ll cover more about getting here in a section at the end of this article). You’ll know that you’ve made it to the right place when see the reflection pool and sculpture out front called Resonance of Life. The ticket office is opposite so once you’ve purchased or exchanged your ticket you make your way down the escalators and descend to the unexpectedly large garden level behind. There are storage lockers at the entry so if you have luggage with you and don’t want to carry it around inside you can lock it up securely. Many of the works blend completely into the park such as the floating sculpture pond by Marta Pan. She was a French abstract sculpture who passed away in 2008. Her works were generally designed to be site specific and complementary to the environment around them. We spent a while watching the vibrant colored koi swimming around in the pond beneath the sculpture and how the bright red she choose fit harmoniously with the colors of the fish and autumn foliage on full display when we were there. 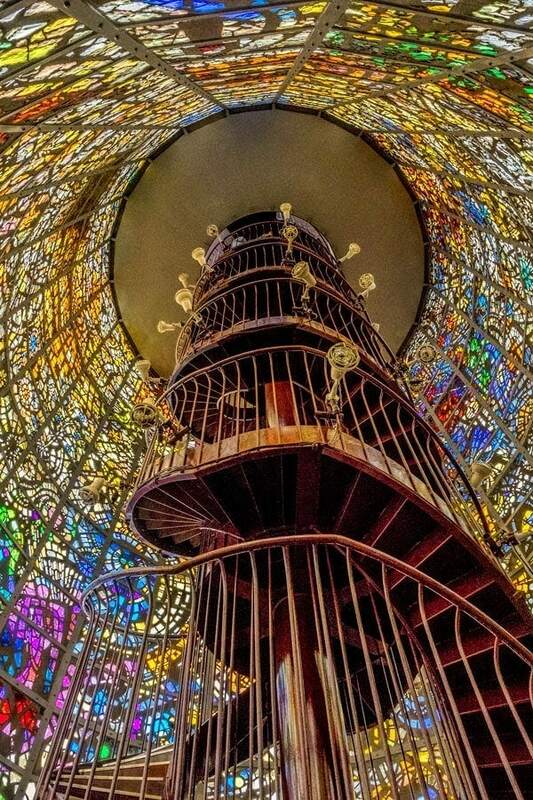 My favorite display was the Symphonic Sculpture a tower built of stained glass with a winding spiral staircase to the top. We spent quite a while at this one, it looks nothing special at all from the outside but inside the magic happens. Even on a mostly overcast day the light shone through the glass lighting it up with pure magic. On a sunny day I’m sure it would be even more spectacular. Make sure you climb the staircase to experience the feeling of being completely surrounded, it’s worth those extra steps. If you want to eat and drink while here there are two restaurants and a cafe. We’d already had lunch in Hakone Yumoto after our soak in the onsen but after wandering around for a while a hot drink and snack sounded appealing so we stopped off at the cafe within the grounds. The food options are limited so if you’re hungry I’d head for one of the restaurants but it’s a beautiful location for a rest stop. The cafe seating overlooks an attractive outdoor foot onsen which was our next stop. These are called Ashiyu in Japanese if you need to ask for directions to one, ashi meaning feet and yu being hot water. The facilities are free to use and if you don’t have a towel you can purchase one from a vending machine for Y100. We do usually have small towels in our bag when in Japan and they can be purchased inexpensively in many gift and souvenir shops. With all the hand washing at shrines and temples, few hand dryers in public restrooms and my new found love of foot onsen like the one in Minoo Park they have become indispensable. Even the kids play areas are a work of art and there are three of them. I’d have loved to capture the inside of this one which looked so much fun but lots of younger children were busy having such an awesome time and not surprisingly they didn’t look like they planned on leaving any time soon. The inside of this creation of giant building blocks was filled with vibrant colored spider webs, bouncy balls hanging from the ceiling and giant jelly donuts. It’s a magic world come alive. 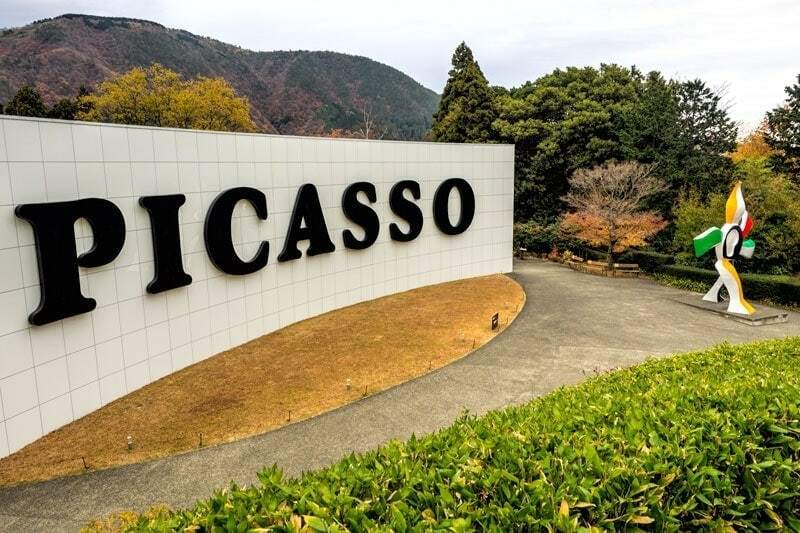 The park is perhaps best known for it’s large and expansive collection of Picasso’s work. This is housed in a dedicated double level gallery within the park. There’s no photography allowed of the collection but it’s an excellent representation of his life and work. Even if, like me, you aren’t really a Picasso fan I found the information it housed and the pieces on show extremely interesting. I had no idea before this visit that his collections were so diverse. The museum is near Gora in the Hakone area. Getting to Hakone from Tokyo is an easy trip and fairly quick making it an ideal day trip from the city. There are 3 option that will depend on your circumstances, the shinkanen, the JR Tokaido Line or the Odakyu Romancecar, possibly in conjunction with the Hakone Free Pass. The shinkansen is the fastest option but is really only necessary if you have an active JR Pass, it makes the trip a little more comfortable, faster and luxe in addition to making good use of the pass but there are other options. 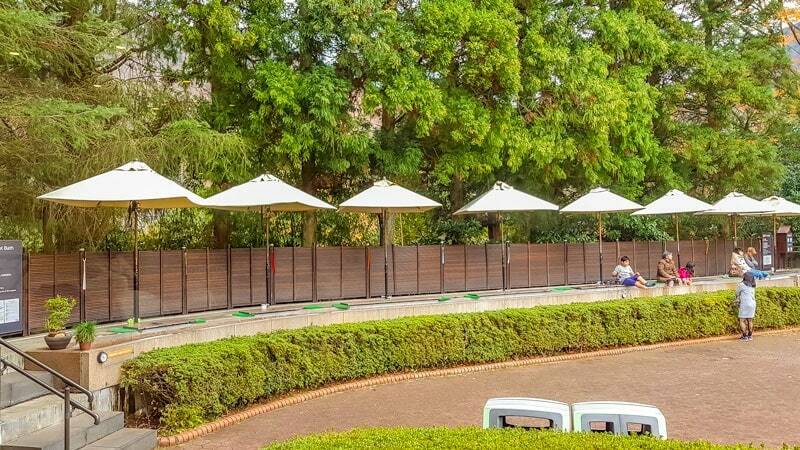 If you’re making a day trip it’s likely you’ll purchase the Hakone Free Pass to use while sightseeing in Hakone, if that’s the case then there is a version of the ticket that goes from Shinjuku in Tokyo and includes return travel to Hakone. If you do this option and want to use the train rather than a bus to get there then you also need to purchase the limited express supplement. They’ve done it this way to give the cheaper bus option but most visitors will want to use the train to maximise their time in Hakone and the additional ticket can catch you out if you aren’t expecting it. Personally I wish they advertised the full price with the supplement so it was clearer. The third option is to use a JR local train, this is on the Tokaido line and can either be literally a local train carriage or for around $10 you can upgrade to a ‘green car’ which is in 2 x 2 seating and like a mini shinkansen carriage with individual seats, tray table, foot rests and other comforts. We’ve done both and in peak hour the green car option was well worth the money for us. You can take you train snacks and drinks into this section if you want, otherwise food and drink should not be eaten in a local train. The entry ticket to the park is Y1600 for adults and if you show your Hakone Free Pass you will get a small discount of Y200 per person. Children and senior citizen tickets are discounted and there are some special group discounts such as family day on Saturdays where there is free entry for children with paying adults. If you aren’t using a pass you can go to their own site and download a Y100 per person discount voucher but they do require it printed, you can’t just show it on your phone. The park opens from 9 am until 5 pm every day including holidays. 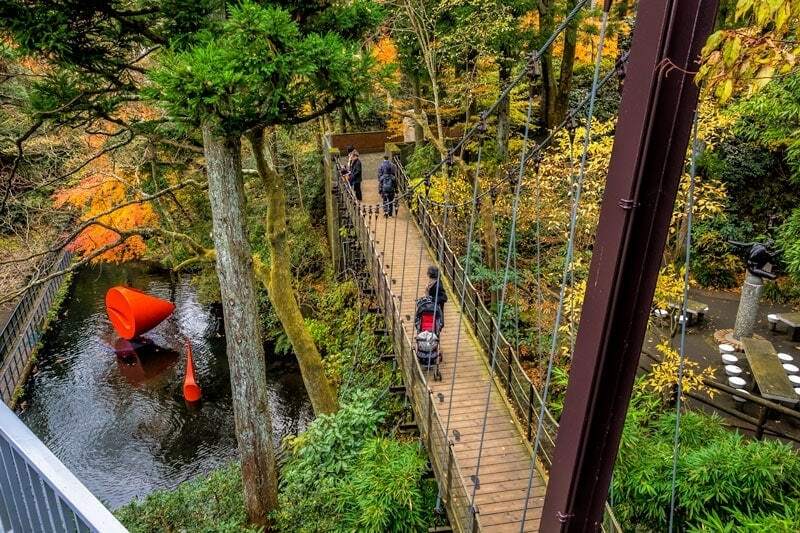 While many people visit Hakone for the day from Tokyo, it’s also a fabulous area to stay overnight and there is plenty to do to fill a 2 or 3 day stay, especially if you love Japan’s onsen culture and a good therapeutic soak in the water of natural hot springs. There are onsen all across the area but we felt Hakone Yumoto was a good base as it offers a variety of restaurants, onsen that are open to day visitors and some interesting local spots to explore. It’s also the quickest location to get to and from by train. If you want to continue on with exploring of Hakone’s other attractions it’s also an easy spot to drop your bags off at the beginning of the day so you aren’t left dragging them around with you. As most will only stay a night or two this might be an opportunity to treat yourself and experience a romantic stay at this adults only ryokan, a traditional Japanese Inn. Kinnotake Tonosawa is rated highly for it’s large luxury rooms that are styled with modern minimalist Japanese furnishings and feature their own private onsen bath overlooking the forest. Another option is Hatago Kintoen, this is also a ryokan property but at a more affordable price point. The rooms are smaller but clean and well presented and the property offers a range of attractive indoor and outdoor hot spring baths for guest use. Something to watch for with Hakone properties is that it’s not uncommon for ryokans, even at a higher price point to have shared bathrooms, this is something we personally choose to avoid but it does make the options more limited and this one good value. We really enjoyed our visit, the location is beautiful, there are a good quantity and variety of pieces and the exhibits are well spaced for enjoyment and impact. For some context we do enjoy non traditional art, particularly outdoor and street art so this was always likely to be a good choice for us. If you like Piccasso’s work, or just want to see what it’s all about the collection is significant and although I wouldn’t call myself a fan I would say it’s a must see. 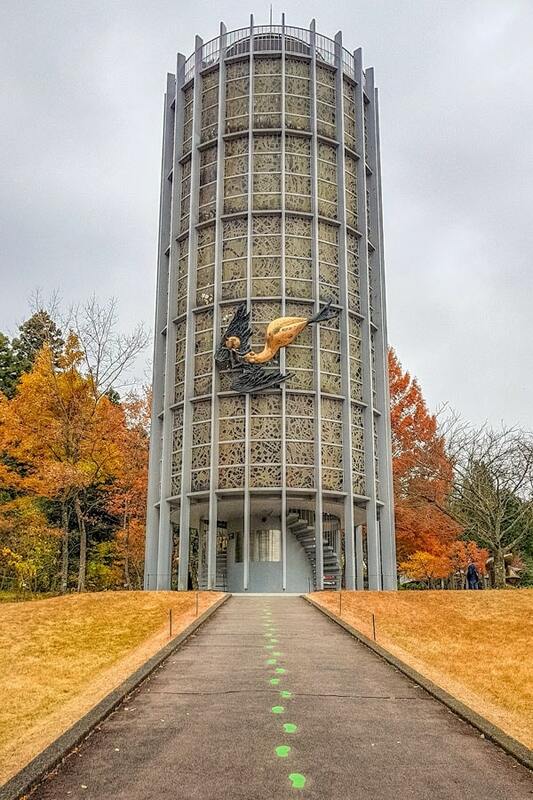 Of the whole park we most enjoyed the Symphonic Sculpture, a stained glass tower that’s incredible inside and of course I do enjoy a good foot onsen, the location of this one with all the open space to look out on made it well worth stopping and rolling up your trousers to enjoy it. My biggest surprise was that with 3 well thought out, colorful and fun play areas spaced throughout the park that this can be an equally good day out with younger children. Interested? Save these images to Pinterest to find it again later. 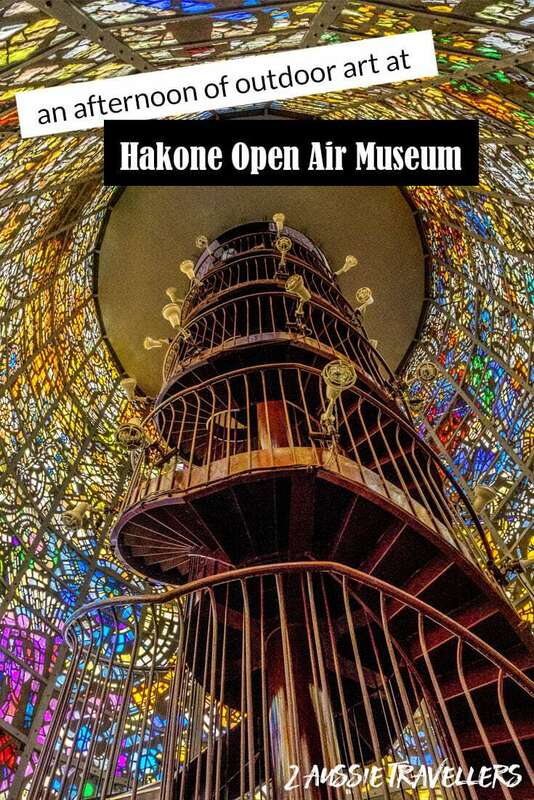 If you have any questions about the art museum or Hakone please ask in the comments below. If you’ve been here already we’d love you to share your thoughts or suggestions of other great non-traditional art installation around the world we need to check out. Hi, we are first timers! We will be having two nights in Hakone travelling from Tokyo and then going down to Kyoto. 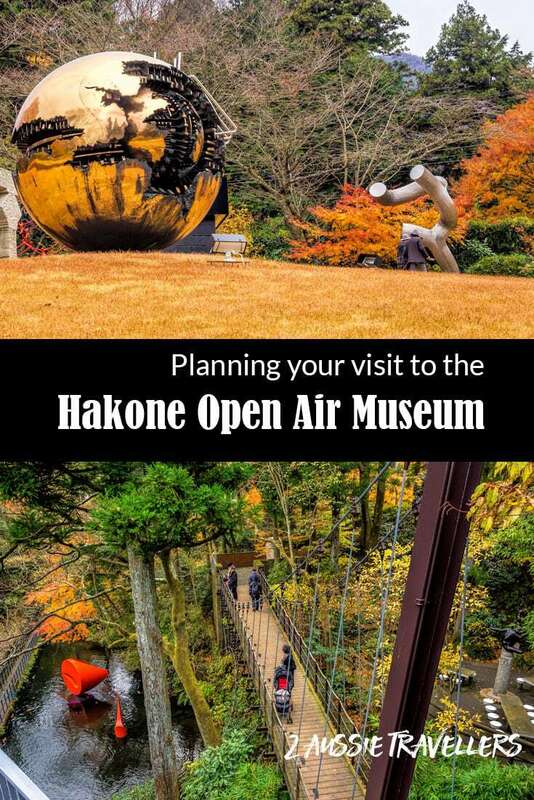 If we go straight to Hakone to drop bags can we get back to The open air museum. Thank you for your information; I follow your instructions..
Hi Julie, travelling around the Hakone region is easy, while the Hakone pass is often referred to in terms of doing the ‘loop’ that is simply for the convenience of getting around the attractions in an efficient manner as possible in a day. You can go back and forwards easily, especially if it’s not too busy. Where are you staying in Hakone to drop your bags? If you’re staying in the Hakone-Yumoto area for example it would be easy to get off there and drop your bags at your accommodation then the Tozan train will get you to Chokoku no Mori station near the Open Air Museum in 35-40 minutes. It runs frequently throughout the day. 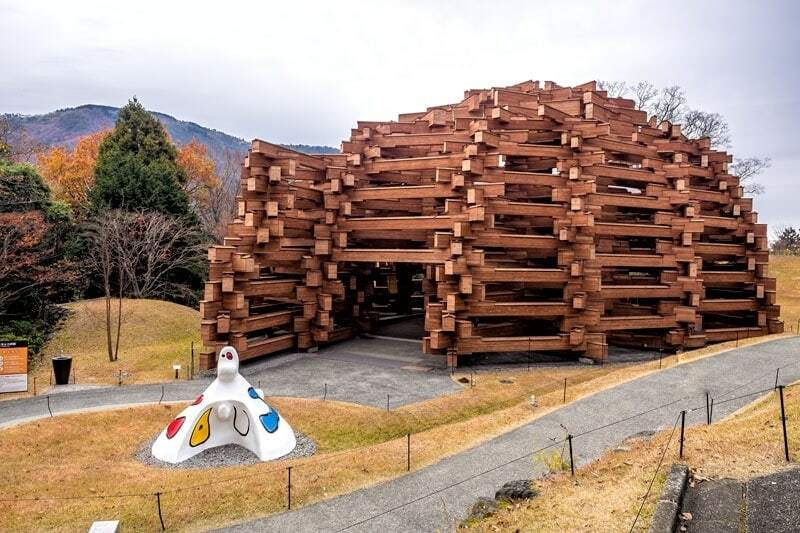 While I’m not much of a museum person, the Hakone Open Air Museum looks like an awesome place to visit. Thanks for sharing this … I just posted to some magazines on Flipboard, and I’ll save it for later for myself too.